Russian gas purchases have been suspended by Ukraine after a breakdown in talks aimed at keeping supplies running for three to six months. The Ukrainian state energy company, Naftogaz, said it would continue transporting Russian gas supplies to other European customers. It will be the second time in less than a year that Russian fuel supplies have stopped running to Ukraine. 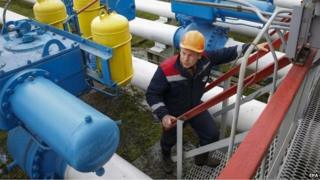 Russian energy minister Alexander Novak called the decision "unfortunate". Moscow hiked prices after Kremlin-backed leader Viktor Yanukovych was ousted in February 2014. It cut off gas supplies in June 2014 as the conflict between the government in Kiev and pro-Russian rebels in the east escalated. Since then, the European Union, which mediated at the price negotiations in Vienna, has forged a series of temporary agreements that need to be renewed every three months. A statement from Naftogaz said: "Since the additional agreement between Naftogaz and Gazprom is expiring on 30 June, and the terms of further Russian gas deliveries to Ukraine were not agreed at today's trilateral talks in Vienna, Naftogaz is suspending purchases from the Russian company." On average, Kiev experiences four months a year when the average temperature is below 0C (32F).